Welcome to my homepage! I am currently a Post-Doc in the star formation group at ITA. The focus of my research is to understand how stars form, and what physical conditions are responsible for setting their properties. Here you will find an overview of my work to date, as well as news of recent and upcoming papers (see below!). Most of my work involves numerical simulations, and involve a wide range of physics, such as self-gravity, fluid dynamics, thermodynamics, and the transport of radiation. With such an array of physics, these simulations can be extremely computationally demanding, and need to be run at National supercomputing facilities such as the Juelich Supercomputing Centre, the Leibniz-Rechnungszentrum (both in Germany) and Texas Advanced Computing Center (USA). Please take a look at my research page for a more detailed overview of what I do. 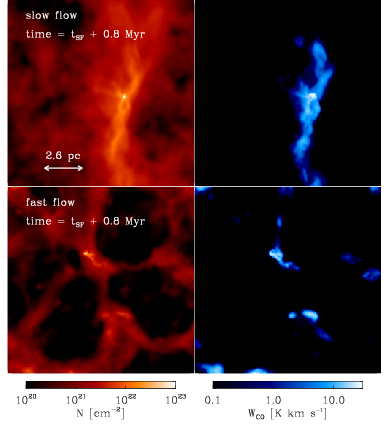 "On the temperature structure of the Galactic Centre cloud G0.253+0.016"
The Galactic Centre is a much harsher envrionment for star formation than is typical for the regions in the solar neighbourhood. Not only is the interstellar radiation field (ISRF) stronger in this region of the galaxy, but the region also has a higher cosmic ray flux - both of which are able to heat the gas and dust in the molecular clouds that form there. However, the true extent of these heat sources is unknown, with widely different values, obtained by a variety of methods, yielding quite different values for their strength. However observations of the gas and dust can provide clues to the strength of the ISRF and cosmic ray flux. In particular, Galactic Centre cloud G0.253+0.016, more commonly referred to as The Brick (due to its exceptionally high density), has been observed to have very little star formation. Given its high density, the apparent lack of star formation activity is surprising. However it also means that the temperature of the cloud is more likely to be set by its environment, than any internal sources. In other words, we can use The Brick as thermometer, to probe the conditions in the Galactic Centre. In this paper, we looked at how different levels of the ISRF and the cosmic-ray ionisation rate (CRIR) affect the gas and dust temperatures of a cloud that has similar properties to The Brick. The project uses a model of the ISM that accounts for the main heating and cooling processes, in addition to following some of the important chemistry (more details can be found in Glover and Clark 2012 and Clark et al. 2012). We find that the ISRF must be around 1000 times the solar neighbourhood value, and the CRIR must be roughly 1E-14 /s, also roughly 1000 times the local value. For such high values of the CRIR, we find that cooling in the cloud's interior is dominated by neutral oxygen, in contrast to standard molecular clouds, which at the same densities are mainly cooled via CO. Our results suggest that the conditions near G0.253+0.016 are more extreme than those generally accepted for the inner 500 pc of the galaxy. "How long does it take to form a molecular cloud?" The life-cycle of molecular clouds sets the time-frame over which the star formation process can occur. As such, molecular cloud formation has received much attention in recent years, as we try to distinguish between theories for 'rapid' or `slow' star formation. In a simplified picture, the cycle can be thought of as comprising three distinct phases: assembly of the cloud, the formation of stars within the cloud, and the cloud's eventual dispersal (often linked to the termination of the star formation process). While we have made some progress on understanding the latter two stages of the cloud life-cycle the first stage is more uncertain, and has prompted much debate. 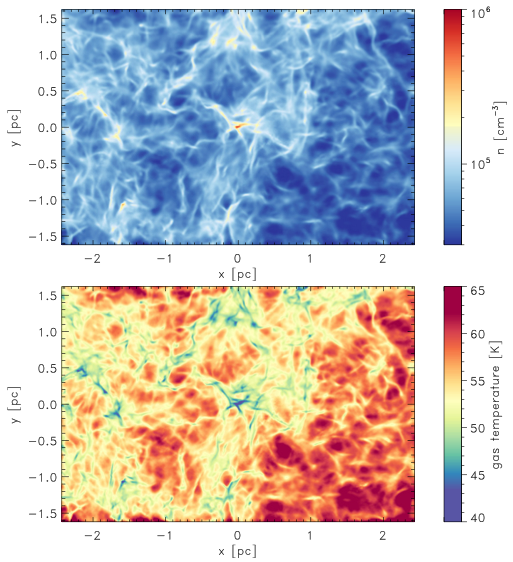 The idea of the colliding flow model for the formation of giant molecular clouds (GMCs) offers a simplified picture of how clouds can be assembled: two warm, marginally supersonic flows of gas collide head-on, and a dense molecular cloud builds up in the shocked layer. We have recently revisited this problem with a new treatment for the time-dependent chemistry that is coupled to a model of the ISM that accounts for the main heating and cooling processes. We looked at two different colliding flows -- a slow flow with 6.8 km/s, and a fast flow with a velocity of 13.6 km/s. The clouds formed by the collision of these flows form stars, with star formation beginning after 16 Myr in the case of the slower flow, but after only 4.4 Myr in the case of the faster flow. 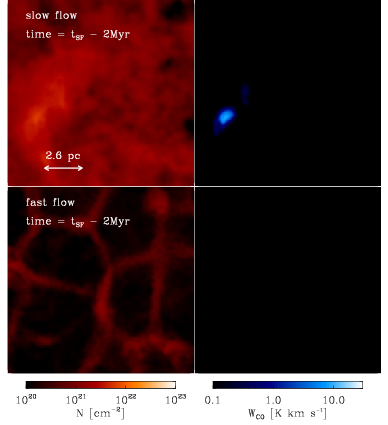 In both flows, the formation of CO-dominated regions occurs only around 2 Myr before the onset of star formation. The images in the figure show the evolution of the column number density (N), and the velocity-integrated intensity in the J (1-0) line of 12CO for the region in which the first star forms in each of the flows. Two times are shown: 2 Myr prior to star formation (left panels), and 0.8 Myr after the onset of star formation (right panels). The CO integrated intensity map is obtained via a radiative transfer calculation performed with the RADMC-3D code, and uses the large velocity gradient approximation to compute the CO level populations.